The Rubber Cafe Design Team Blog: Happy 4th of July! Loving this card for The Rubber Cafe using the Home of the Red, White and Blue Creative Cafe Kit! The card base is the navy blue paper in the kit. The camera does not do this card justice, but the metallic silver paper in the kit is absolutely stunning when run through an embossing folder. I used a star folder from Cuttlebug. The stars in the kit fit perfectly inside as an embellishment! I added sequins in contrasting colors to each star for a pop of fun! I stamped the United States image and then colored it with red, white and light grey Copic markers. I fussy cut it and popped it up on foam tape to add some dimensional interest to this card. I love the effect of the USA popped up add floating above the card panel. The squiggly piece along the bottom was created by cutting along one of the patterned papers in the kit and then flipping it over and using the back side. It's a fun way to get a *free* embellishment from your paper to dress up your card! 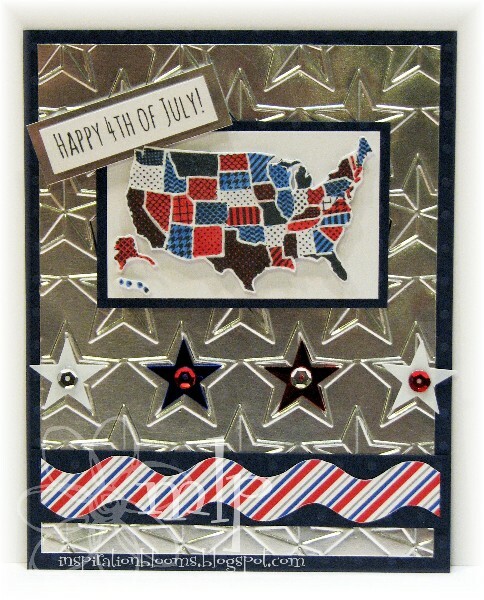 Paper, Stamps, Embellishments: Home of the Red, White and Blue Creative Cafe Kit!